For as long as I can remember, The Sims has made me feel bad about my computer. When the original game was released and I had that first unbeatable taste of controlling another human being (I totally get the appeal, non-specified deity) I begged for it as a gift. When it was finally mine I was disappointed to find that my family computer wasn’t quite up to the task of making my micro-management dreams come true (minimum running requirements weren’t something I was particularly au fait with at that point in time). The game ended up gathering dust for some time until we purchased a new computer that was capable of running it. Then The Sims 2 was released. This time I understood that I had to wait. And wait I did. Eventually, a little bit after the initial release, I upgraded my Sims experience. When The Sims 3 came along my laptop was, once again, not really up to the task of providing a satisfying Sims experience but by this point I was so determined not to wait I was willing to put up with the occasional burn on my legs and system shut down to enjoy that sweet open neighborhood experience. I think it was to the relief of everyone that when The Sims 4 was released I had stopped trying to keep up with the latest releases and was quite content to plod along with The Sims 3. I did at one point last year consider purchasing The Sims 4 but decided my laptop didn’t deserve to be put through the technological equivalent of the ten labors of Hercules. Now, I know what you’re thinking: why not just get a newer and better laptop? Well, laptops are expensive and as much as we all wish it was, the motherlode/rosebud Sims money cheat is not a real thing. Don’t think I haven’t tried. Given that I do most of my gaming on consoles, buying a better laptop for The Sims isn’t really something I can justify. It can handle browsing and the point-and-click games I play ad nauseum (as long as they’re installed one at a time) and that’s quite enough. If it ain’t broke, don’t make yourself broke. I’m sure I’m not alone here but my gaming console was the best way for me to keep up with the latest game releases. Unlike our family PC, it was entirely mine and for years at a time it was able to run the latest releases without asking anything of me in terms of upgrades or system requirements. As such I’ve come to rely on console gaming. This has, however, meant I’ve missed out on some greatness. There have been console releases of The Sims over the years but they never matched up. Yes, I know most of The Black Eyed Peas songs in Simlish better than I know them in English but, as hard as they tried, releases like Urbz and Bustin’ Out never had the same depth or control as the PC versions. Think how happy I was, then, when it was announced that The Sims 4 would be coming to consoles on November 17 with almost all of the functionalities of the PC version. It was finally happening. So, is the console version of The Sims 4 everything I wanted it to be? Well, yes and no. It is indeed the most PC-like Sims experience I’ve ever had on a console and I’ve thoroughly enjoyed it thus far but some compromises have had to be made. I wonder if a lot of the issues I have with the console version of The Sims 4 is that, despite many years away from the franchise, I’m still largely used to the PC controls and UI. There’s a sense of minute control that comes from using a mouse and keyboard that you just don’t get from a console controller. While in the game’s Live Mode, I loved the freedom the controller joysticks gave me over camera distance and angle but when trying to engage in the more detailed constructive Build and Build A Sim modes I struggled slightly more. As someone used to the PC controls, I felt like I had a little less cursor control with the DualShock 4. The PS4 version of the game certainly didn’t feel like it ran noticeably worse but it felt a little more unwieldy. For example, it’s somewhat disconcerting that an accidental twitch from your thumb on an overly-sensitive stick while building a Sim could make their cheekbones three times as wide as their chin. A temporary drawback of the console version of the game is that you won’t have immediate access to all of the PC expansions that have been released over the last three years. 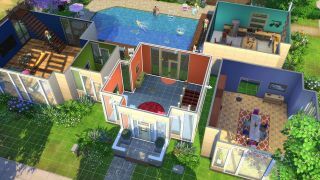 It’s the expansions that really make The Sims great – they add variety to gameplay and a degree of customization so without them the game feels somewhat bare-boned. It has, however, been promised that far more of these expansions will come to the console version in time as DLC. It’s also somewhat unfortunate that the console versions of the game won’t support mods at all. Mods have been introduced to games such as Skyrim and Fallout and they’re a massive reason The Sims 3 community on PC continues to thrive. Whether they’ll come in the future or not is unclear, but given that they’re such a massive part of the PC Sims experience for many it seems remiss not to support them in some form. If you can run the PC version of the game with no fuss, I’m always going to recommend that you do so. It’s always going to be the best experience as the sense of control that comes from PC gaming really does lend itself to the granularity of The Sims. Plus, at the moment the PC version has far more content on offer. If, however, you can’t play the PC version of the game for any reason but you really want to enjoy the wish-fulfillment and vicarious living (what do you mean the loo roll never runs out?) The Sims 4 on console is still worthy of your time. Yes, it has a learning curve for those accustomed to the PC experience but it’s nice to have the ability to access that experience through another means. It has the feature we all really want most anyway: the cheats. Sure, I still feel bad about my laptop but at least now I’m not locked out of the wish fulfillment. My Sim has an amazing multi-computer setup in her mansion with its three pools and fully-stocked fridge.